ABOVE: Windows of the Hotel Münchner Hof und Blauer Turm on the Tändlergasse. INSET BELOW: The comfortable lounge with its vaulted ceiling. The four-star Hotel Münchner Hof und Blauer Turm has been owned by the same family for more than three-quarters of a century, but the building is much older than that: It dates back to the 13th Century, when Regensburg was an important mercantile city on the most important trade route between Venice and Northern Europe. 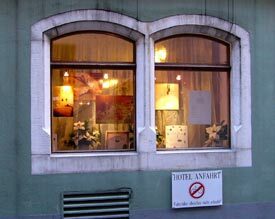 Like many older European hotels, the Münchner Hof has a number of different room styles and rates. All of its single, double, and triple rooms have modern private bathrooms with showers or tubs. In addition to the original building or "Great Manor," the hotel has a "Blue Tower" annex where you can book a junior suite or tower room at slightly higher price than a "comfort room" in the main building. Public rooms include a large reception area with an adjoining lounge (see inset photo) where you can read tourist literature while munching on pretzels. During the holiday season, complimentary Glühwein and Christmas cookies are available in the lobby. Rates include free Internet access and an excellent buffet breakfast in the hotel's atmospheric Gaststätte or pub-restaurant, which is also open for lunch and dinner. Overall impression: A pleasant, comfortable, and efficiently-run hotel. The standard rooms aren't especially atmospheric, so opt for a "preferred room" or suite if you're on a honeymoon or anniversary trip. The Hotel Münchner Hof is on the Tändlergasse in Regensburg's Altstadt, just around the corner from the Neupfarrplatz, a large square with the Neupfarrkirche, Document Neupfarrplatz, and the largest of the city's Christmas markets. To reach the Münchner Hof from the railroad station, walk up the Maximilianstrasse (the main avenue into town). When you reach Am Frauenbergl (on the lower left side of the Alter Kornmarkt square), head left and keep going until you're past the Kaufhof department store. Tändlergasse heads off to the right at the western or left side of the Neupfarrplatz. If you're driving, you can get a special hotel-guest parking rate at the nearby Parkhaus am Petersweg. For more information or reservations, see Booking.com's Hotel Münchner Hof und Blauer Turm Web pages.